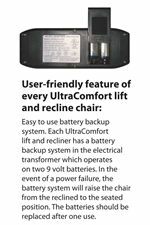 This lift recliner comes standard with an articulating headrest and adjustable lumbar all operated by a single hand control. In addition to the lumbar, the articulating headrest has been adjusted to move the entire top of the recliner providing support not only to your head but to your shoulders as well. Weight capacity: 375 lbs. 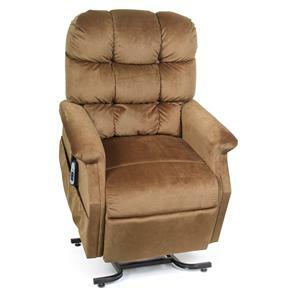 Distance Required from Wall Reclined 18.5"
The Tranquility Medium Power Lift Recliner with Adj Headrest & Lumbar by Brookdale at Morris Home in the Dayton, Cincinnati, Columbus, Ohio, Northern Kentucky area. Product availability may vary. Contact us for the most current availability on this product. 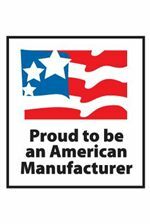 Fabric Options Up to 6 standard fabric options, and up to 18 total fabric options available. Frame Construction Crafted from northern maple and poplar wood frames. Warranty Lifetime warranty on chair frame, lift frame and recline mechanism. 3 year warranty on electrical parts. With a focus on luxury and style, the Tranquility Collection offers plush comfort cushioning and modern design all-in-one. 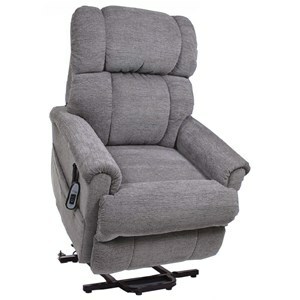 With a selection of several distinct models, you are sure to find a look and feel that is right for you when searching for the perfect lift recliner. You don't have to sacrifice style when looking for exceptional comfort. With the Tranquility Collection, lasting comfort and unique style go hand-in-hand. The Tranquility collection is a great option if you are looking for Casual furniture in the Dayton, Cincinnati, Columbus, Ohio, Northern Kentucky area. Browse other items in the Tranquility collection from Morris Home in the Dayton, Cincinnati, Columbus, Ohio, Northern Kentucky area.